March 8 is a big holiday in Russia. It is called the International Women's Day. 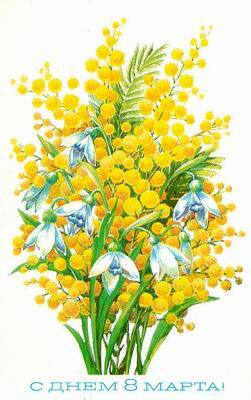 If you come to Russia on the 8th of March then you will see that almost every man is bringing flowers (mostly mimosas) to his loved ones. Everybody congratulates women, girls, moms. I would also like to congratulate women's chess players with this wonderful day! Let me wish all of us happiness and love! Let us wish that our children will be happy and healthy and we always have loved ones next to us. What is the best way to celebrate this special day? To organize a chess tournament, of course! A women's chess tournament to be precise. That's probably why, every year since 1965 in March there is a very strong women's international chess tournament. The 42nd Women's International 8th of March Tournament is taking place right now in Belgrade, Serbia. The First Women's International March 8 Tournament was organized between March 8 and 24, 1965, in honour of The International Women's Day - March 8. The International March 8 Tournaments have become a tradition in Belgrade, and with the exception of 1980 and 1984, have been held every year. In 1980, the tournament wasn't held at all due to financial reasons, and in 1984, it was played according to the Swiss system, but only with the participion of local players. Almost all the leading women chess players have competed in the March 8 Tournaments, including many world champions. The legendary Nona Gaprindashvilli was the seven-times winner and in 1971 she scored 100% - 13 points in 13 games! Today the organizer of the tournament, the Belgrade Chess Association, tried to save tradition of the tournament and has managed to do that. This year, the 42nd International Women's Grandmaster Chess Tournament is being held from the 3rd to the 11th of March. 5 rounds have been played so far and Margarita Voiska from Bulgaria is in the lead right now with 4 points out of 5. You can follow how is it going on the official web-site, here. I want you to Join the CJA today!